Thought controls action or lack of action. The ability to control thought was a weapon of war along side other means of persuasion. Back in 1922, noted journalist, Walter Lippman, reviewed in his book, "Public Opinion", French World War 1 military reports. He concluded that the French military always highlighted German losses and not French casualties which were equally as bad. He said, "We call this propaganda". The Library of Congress Companion edition has included a brilliant exposition of propaganda. It dissects the word to its simplest function. Manipulate the news for a specific purpose, and deliver it to a public that does not have the capacity to independently investigate its veracity. 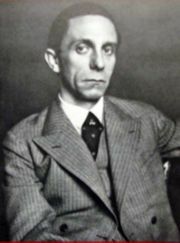 When the Nazis ascended to power in Germany during the 1930s, government departments were created under Joseph Goebbels, Minister of Propaganda, that sought to control the social and cultural fabric of German life. He expressed his mission as follows: "Be as faithful to the truth as necessary but omit and expand it as you think right in relation to your public". Control, a symptom of all Germany's potential fascist partners, extended to speech, films, books, fine arts, radio and press. His umbrella organization went by the initials RMVP (Ministry of People's Enlightenment and Propaganda). 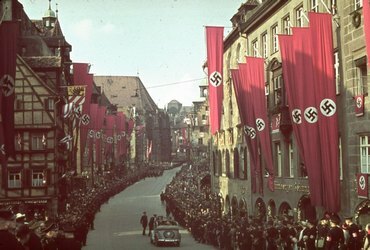 The new departments recruited young, educated Germans who were dedicated Nazis. The control was so complete that in order to be employed in any of these media a permit from the government was necessary. Goebbels most immediate and continuous target were Jews. 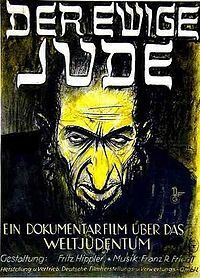 The film advertised below was titled: "The Eternal Jew". The poster conveyed the "message". Geobbels and his entire family would spend the last moments of their lives in an underground shelter built specifically for the Minister of propaganda. A similar fate for his Fuhrer who defined the Nazi propaganda in his book, Mein Kampf, wrote: "every one will be convinced the fact is real". Both their deaths confirmed these facts were real. Goebbels had spent a career burnishing Adolph Hitler as the embodiment of the pure Aryan. The German was always the martyred victim. Rudolph Hess, number 2 in the Nazi hierarchy, until he defected to England, said in a 1936 speech referring to the German mythical hero, Horst Wessel, "From this idea of Germany, Adolf Hitler created the proud reality of the Third Reich". Hitler stood at the top of the pantheon of German heroes. 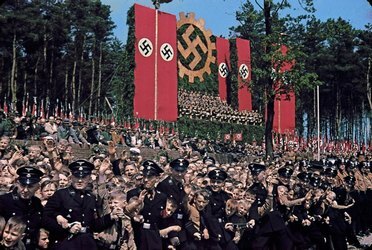 The myth of Aryan invincibility was supported in all the media and the dissemination of pictures highlighting the glory of the Third Reich which would "last a thousand years". As war began in 1939 with an attack on Poland, the Nazi regime sought to deceive the world by justifying the forthcoming invasion. Their public statement was planted in German newspaper headlines on September 1. "Polish volunteers and Upper Silesian rebels' attacked a German transmitter (radio) at Gleiwitz (Poland). This transparent deception was a charade in which German soldiers, out of uniform and dressed as Poles, had engineered the "attack". 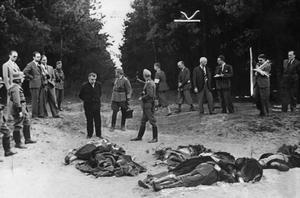 English: Bromberg, corpses of slain ethnic Germans. Mr. Chamberlain! You gave Poland a blank cheque for this atrocity! On your head the blood of these victims comes! If you had any spark of feeling left, for humanity, truthfulness and fairness, you would have been filled with horror at the sight of the visual evidence of the Bromberg blood victims. For example: foreign journalists bear witness at the scene of Poland's terrible acts of murder in Bromberg. 9.9.39 photo Weltbild Fremke 212-39. As was the case with weapon systems in World War 2, new technologies found a home in the "thought war" in radio and film. These media, because of new technologies, had grown exponentially between the two big wars of the century. They offered the ability to disseminate a message that transcended borders and oceans.The message was not limited to the domestic public, but carried to the enemy, to an occupied country, to your troops, to "their' troops. Celebrities and soldiers became spokesmen and were employed to disseminate information in Britain and the United States. Their task was to reduce the complex to simple versions and using understatement to avoid the look of propaganda. British Foreign office minutes revealed a methodology that used emphasis through "subtle presentation". Leni Riefenstahl was a German international star of film and dance. She became enamored with the goals of Hitler's National Socialism party and used her skills to advance their image. 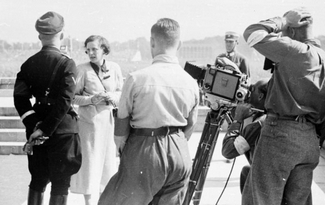 Below she speaks to SS Chief, Heinrich Himmler, with her camera at the ready to film a Nazi spectacle. Newspapers, during the 10 years prior to World War 2 ,captured world news in moments through modern, instant communication. The printing press would not only be unrecognizable to Gutenberg, but a foreign body to printers of 1918. Control of these media was a concern for every industrialized society. Whether that meant "spin" of facts or outright censorship was dependent on the form of the political institutions that formed the structure of the government. This was most evident in the pre-war years. 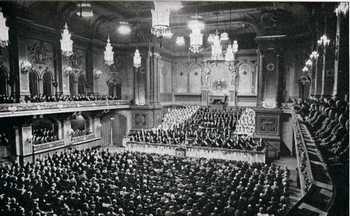 "If the great test of a war is that it brings challenges that can only be met by using all moral and material resources, the German people passed the test in the past year. It will doubtless go down in history as the most glorious of this great struggle for our existence". "In the midst of the trials and burdens of the moment, it is all too easy to forget that this war, in contrast to those of the past, has a thoroughly national or racial character. That is why both sides fight with such bitter determination. The participant peoples know that this time it is not a matter of a more or less significant change in national boundaries, but rather a matter of national survival"
Democratically rooted societies in the pre-war years were not homogeneous in their approach to the presentation of news and more liberal with cultural art forms. Great Britain relied on voluntary self- enforcement provided the activity did not step beyond the boundaries of relevant laws. It was only at that point that the penalties provided were enforced. The United States also depended on the voluntary self discipline of its citizens and the media protected by the Constitution but exercising good sense within the boundaries of patriotism. In 1936, the British were close students of the Nazi emergence. Their ability to effect rapid change was impressive, The German citizens appeared four square behind the glorification of the state and the corresponding loss of individual choice. The controlled messages extolling Adolph Hitler (the embodiment of the Third Reich) and scapegoating minorities found support in a vocal British minority. The German model had its competition for the minds and hearts of people. The Wehrmacht, representing the interest of the army, issued its own bulletins with their slant on military news directed at enemy troops in their magazine, "Signal". The intention was to demoralize and promote surrender. In the early days of the invasion of Russia when militarily they were tasting victories, certain letters home from German soldiers on the eastern front were published for the German public. They told of extreme starvation of the Russian peasants, and by extension, the ample food on the table of the German public. . The British followed suit. The British Foreign Office competed with the MOI, and their domains often overlapped spreading mixed messages. The English model failed to effect coordination between the agencies. A speech by Winston Churchill crossed lines of both agencies. He would not sugar coat bad news which was more evident in a free society, but always would end with an uplifting note of hope for the future. In contrast to the German government's heavy hand in its presentation of the news, the British authorities were more subtle. The Soviet ally conformed to the pattern followed by the fascist countries. Reports on the war emphasized and overstated German losses and minimized Russian casualties. They would report on multi- million German deaths and make no mention of starvation in Leningrad.That is not to say that those practices did not find its way into United States media. In April 1943, General Eisenhower announced victory in Tunisia and enemy casualties over 66,000. Not a word spoken about allied losses sustained by the 1st Armored division and their rifle brigade. The United States came late to the propaganda game, but quickly set up 26 distinct agencies that divided the duties between domestic consumption and overseas out reach. Their efforts extended to all media intent on promoting the government's war aims and reporting on the war status. In a frank statement on the mission of the Office of War Information (OWI) the director on the domestic side, Gardner Cowles Jr., explained that his organization attempted to create an environment for the" freest exchange" of information. He went on to say: "But we aren't neutral" and "employ the strategy of truth, for a purpose--to help win the war". With those words, particularly the "strategy of truth" he might well have been speaking for all such organizations in every country. The United States extensively used radio to reach foreign ears to sell its message that the war was a fight for freedom and the liberties enjoyed by Americans and for all people. The Voice of America had offices in 25 countries. Nevertheless, the United States Office of Censorship reviewed all international communications. Radio Freedom House broadcast a weekly program in the United States rebutting German radio claims. It was named, "Entertaining Lies". Radio was not merely background noise. It was a weapon used with varying degrees of success. There was a common thread-----affect and lower morale of civilians and enemy troops. "Black" propaganda sought to undermine by spreading phony facts, and even used fake broadcasts from non existent radio stations. In the earliest stages of the war, German's beamed into France anti British information to undermine the French-British alliance. One broadcast advised the French that their government was about to abandon Paris. Italians beamed into the middle east countries false information intimating that the British favored the Jews over the Arabs. The Japanese broadcast similar disinformation in English into Australia. The British used broadcast time to reach a German audience. Selfton Delmer, an employee of the Daily Mail, warned that high officials were turning a dishonest profit from the war. Purportedly, this broadcast ploy was initiated by members of the German military. The war produced a different kind of turn coat-----the radio traitor. The infamous William Joyce, British fascist, born in America, broadcast from Germany into English homes as Lord Haw Haw. After the war, he was repatriated to England, received a due process trial, convicted as a traitor, and executed. American troops had their counterpart called Axis Sally whose broadcasts were completely discounted by her audience.After the war she returned to the United States and blended into obscurity. The Italians also had their "American". The famous poet, Ezra Pound, a torrid anti-Semite and Roosevelt hater, broadcast his hate filled screed presumably from a Roman station. The Pacific Theater had their Tokyo Rose which came to them in their jungle bases over Zero Radio from Japan. The Marines were subjected to her disinformation war. "The 1st Marine Division--all are dead---by the thousands laying on the beach". Her program was welcomed by the Americans because she played the latest American music, and her pitch was a running joke with her audience. In short, and for the most part, this disinformation war was soundly ignored by the intended audience, and often for Americans, a source of comedy. Some methods employed by Americans may have borne fruit. In North Africa, they dropped over 10 million leaflets on the enemy lines. They promised safe conduct for those who surrendered, and "comfortable internment". 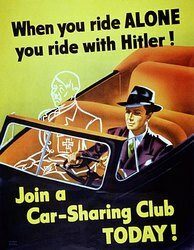 In simplest terms, "white" propaganda at home was intended to boost domestic morale and stimulate hatred of the enemy. One method that struck an emotional chord amongst Americans was the fear of Fifth Columnists---home grown spies and saboteurs in the states. Although there is little evidence that the fear was justified, Americans were constantly to be aware of consequences of divulging military secrets---especially those learned at the workplace. Every American knew that "Loose lips sink ships". In Germany it was, "the enemy is listening". 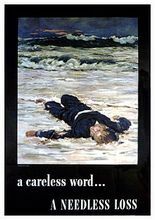 In Great Britain, "Careless talk costs lives". In Japan, "Kodo". The way of the emperor----connoting Japanese dominion over Asia. 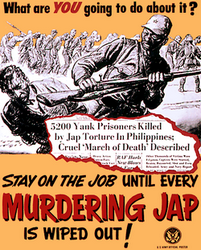 Government sponsored posters appealed to defense related workers to stay on their jobs. 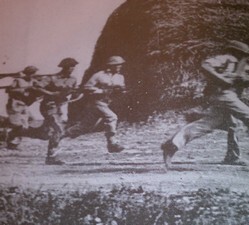 Americans were reminded that accepting rationing of gas, food, any resources used by the armed services was patriotic. German and Japanese were always depicted with ugly faces. Motion pictures replaced the gangster with portrayals of Nazis or Japanese villains. Americans were very much race conscious. Segregation still existed for civilians and soldiers. Black and white were in separate military units. Ethnic posters supporting bond drives portrayed white soldiers, and in African American areas, the soldier was black. Caricatures were favored media methods to promote or denigrate an idea or a person. 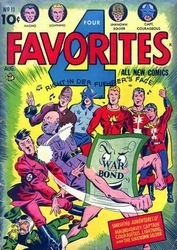 Children were targeted to buy war bonds. The enemy was savaged. 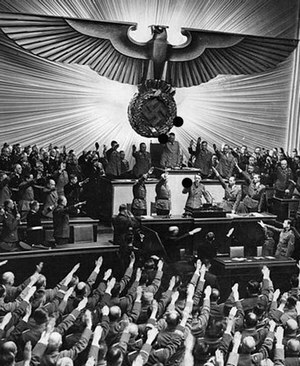 In 1942, the leading popular press organ for the Nazis was Der Sturmer. His newspaper wrote constant anti Jewish diatribes. In one issue, his staff writer wrote,"Jewry is organized world criminality. The Jewish danger will be eliminated only when Jewry throughout the world has ceased to exist". In May 1944, an article appeared in the Stuttgarter NS Courier. How it passed censorship was remarkable. The reporter wrote that the British were way ahead of the Germans in broadcasting the news. "They know how to use it as a strategy .Too much untruthful good news promotes disbelief, and the public stops trusting the reports". Apparently, he was reporting on sentiments that were taking hold in the public mind. In Germany and Italy, many radio sets were clandestinely tuned to the British Broadcasting Company (BBC) for news of the war. Finally, the children, inheritors of the dreamed of Nazi dominion over the western world were targeted for propaganda. They were introduced to board games that extolled Nazi Stuka dive bombers. 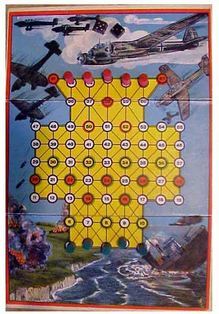 The object of the game was during a bombing raid on an enemy base the player would avoid search lights and flak. Boys and girls ages 10-14 (Jungvolk and Jungmadel) were enlisted in the Hitler Youth Training programs. 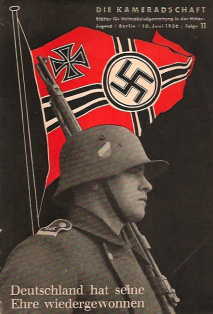 They were distributed training manuals with suggestive covers preparing them for eventual service, dedicating their lives to Nazi ideals, and inculcating them with the Nazi goal of regaining their honor. World War II Companion, David M. Kennedy, Editor. Simon & Shuster, New York 2007.